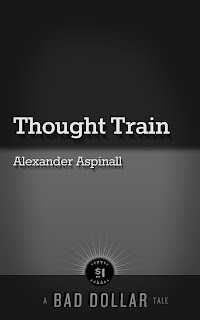 My first digital short for Kindle was published recently. 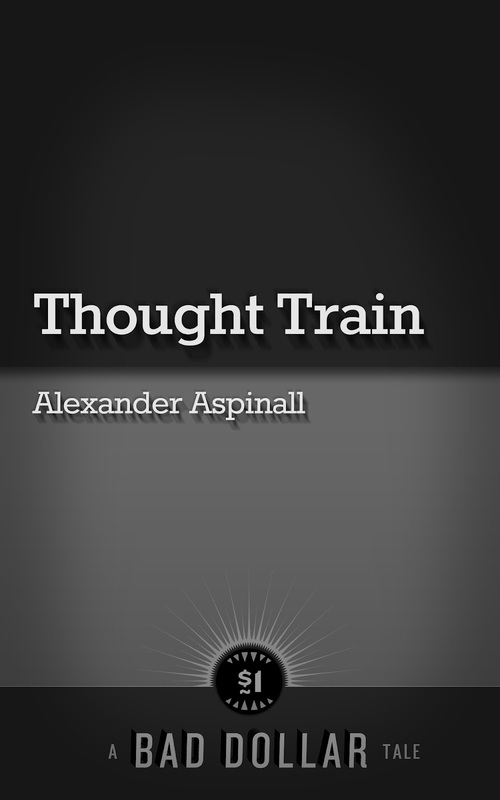 It is called Thought Train. It is a short story, detailing the time when I was sucked into a succession of parallel universes. The story is my contribution to the excellent baddollar project. You can read it on your Kindle or on the Kindle apps available on smartphones and other computing devices. A man escaped certain death uninjured earlier when everything blew up. 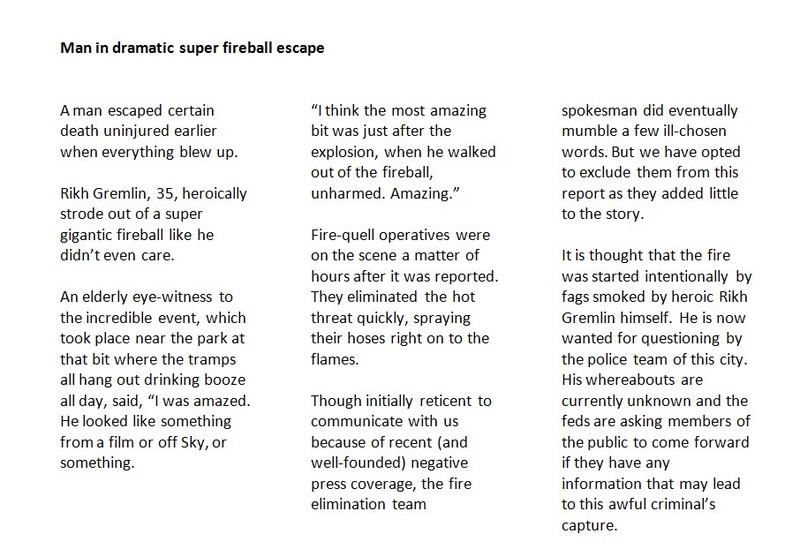 Rikh Gremlin, 35, heroically strode out of a super gigantic fireball like he didn’t even care. An elderly eye-witness to the incredible event, which took place near the park at that bit where the tramps all hang out drinking booze all day, said, “I was amazed. He looked like something from a film or off Sky, or something. Fire-quell operatives were on the scene a matter of hours after it was reported. They eliminated the hot threat quickly, spraying their hoses right on to the flames. Though initially reticent to communicate with us because of recent (and well-founded) negative press coverage, the fire elimination team spokesman did eventually mumble a few ill-chosen words. But we have opted to exclude them from this report as they added little to the story. 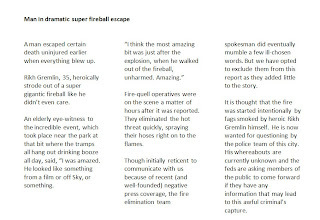 It is thought that the fire was started intentionally by fags smoked by heroic Rikh Gremlin himself. He is now wanted for questioning by the police team of this city. His whereabouts are currently unknown and the feds are asking members of the public to come forward if they have any information that may lead to this awful criminal’s capture. 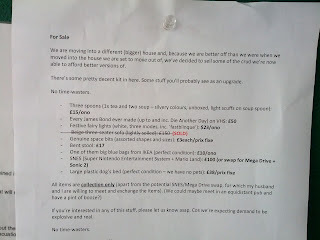 We are moving into a different (bigger) house and, because we are better off than we were when we moved into the house we are set to move out of, we’ve decided to sell some of the crud we’re now able to afford better versions of. There’s some pretty decent kit in here. Some stuff you’ll probably see as an upgrade. If you’re interested in any of this stuff, please let us know asap. 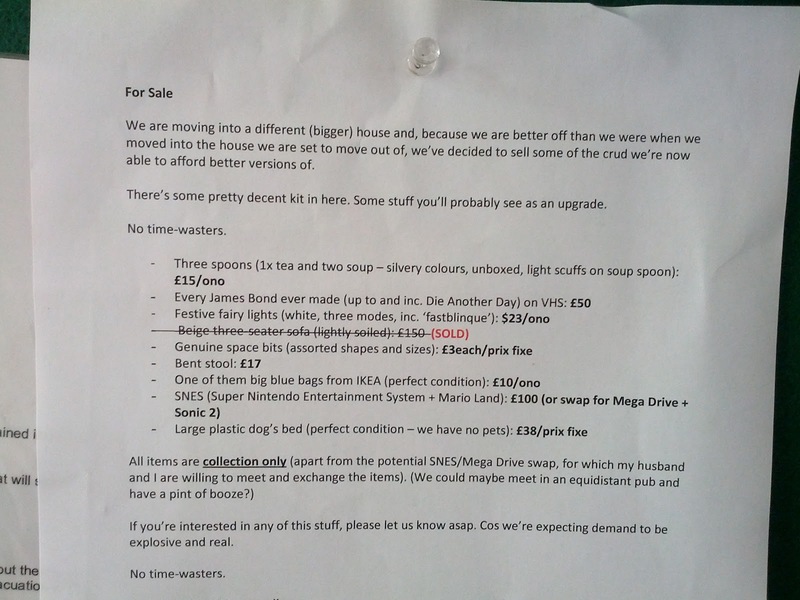 Cos we’re expecting demand to be explosive and real.